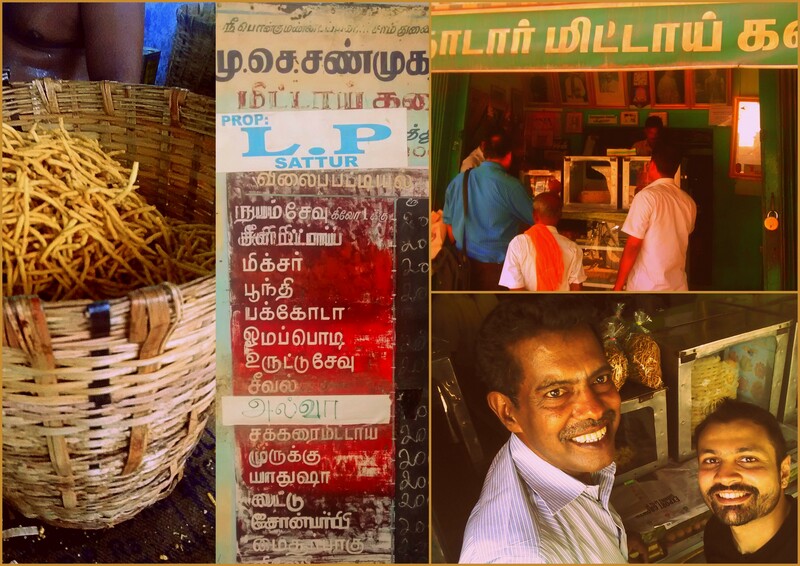 We drive to Sattur – a nearby town in Virudhunagar, famous for the Karasevu (a spicy snack made with chickpea flour). A quaint little town, I walk to the famous Shanmuga Nadar Mittai Kadai (Shanmuga Nagar sweet shop) which has been around for generations now. Mr. Arumugaswamy, the 4th generation in the family business takes me through the history of the shop. I learn from him that the ex chief minister Mr. K. Kamaraj, (who incidentally was born in Virudhunagar) used to patronize this store. With warmth, I was showered with samples of all the sweets in the store, with the result that I badly needed something spicy. Voila! Here comes the Karasevu. These beautiful slender crisps made with chickpea flour are a perfect snack on a rainy day with a cuppa filter coffee! Intrigued by the taste of the Karasevu, I ask Mr. Arumugaswamy to take me to the place where they make it. He readily obliges and takes me to the kitchen. The Karasev production area is an old house that has been converted into a kitchen. Mind you – I am not talking about a space with state of the art, automated machines. Everything is done manually – right from the drying of the rice/spices to the pounding of the rice flour/ spices and mixing of the dough for the karasev. The people working here have been around for years and claim their karasev tastes the best only because it is made by hand from the heart. 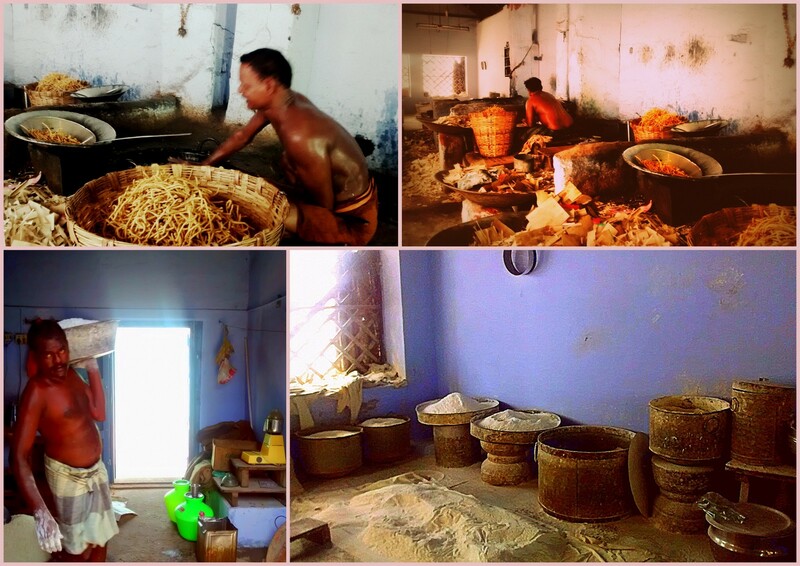 These photos take you through the kitchen showing you the age old storage vessels, people manually carrying rice flour to mix the dough and also capture the panorama of the kitchen. The kitchen is over 100 years old and has seen men come and ago, but one thing remains the same – The Karasevu. Muniswamy, the master who mixes the dough showed me how it is mixed and the ingredients that go into it. The furnace is ancient and inspite of modern technology they do not use gas or electricity to fire the furnaces, but instead rubber resins. This is also cost effective, I was told. These men sit right next to the furnace with a huge ladle in their hand and scoop out dollops of the mixed dough and sieve the dough through the ladle right onto the piping wok of oil.